UPDATE: THE WINNER OF THE GIVEAWAY IS TARA! Thanks everyone for commenting and I really encourage you all to check out Karen's marvelous MG books! I recently requested a book off NetGalley based mainly on the cover and the premise of “The Parent Trap meets the digital age”, but I hadn’t heard of the book or author and had no idea what to expect. 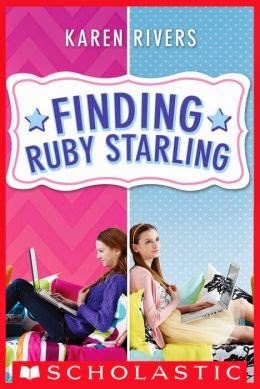 FINDING RUBY STARLING by Karen Rivers delighted me so much I ended up tracking down the fantastic author to answer a few of my questions, and one very lucky blog commenter will win a signed copy of FINDING RUBY STARLING and a copy of its companion novel THE ENCYCLOPEDIA OF ME. Karen was awesome enough to answer a few of my questions. FINDING RUBY STARLING is a companion novel to THE ENCYCLOPEDIA OF ME. Since I haven't read THE ENCYCLOPEDIA yet, I can definitely attest that RUBY STARLING stands alone, though now I can't wait to read THE ENCYCLOPEDIA. How did the companion novel come about? Did you have Ruth's story in mind when you were writing THE ENCYCLOPEDIA? FINDING RUBY STARLING is written almost entirely in emails (with the occasional claymation video script and Tumblr poem thrown in). I was concerned as the story went on that we might not get the full weight of the climax, as filtered through emails. As it turned out, I shouldn't have worried (if my sobbing was any indication). How did you decide whose perspective certain scenes should come through? Was it a struggle to hit the right emotional tones in pivotal scenes, given the structural limitations you'd given yourself? I honestly didn't think of it that way, about who should have the perspective. It just happened naturally. I wrote the book in the order that you are reading it in, when it felt like Ruth's/Ruby's "turn", then I just pivoted and went with it. Some of the scenes were harder than others. The ones that come to mind are the letters from Ruby's mum and from her Nan. Those ones had a LOT of editing. It was hard to go there without going either too far, or not far enough. My instinct was to pull back, but luckily my editor, Cheryl Klein, is smarter than me and convinced me to just put it all out there. You write super convincingly as both British and American -- and you are Canadian, right? Have you spent time in the UK, or do you have British relatives? (Amazeog is my new favorite word, by the way.) How did you decide to make Ruby British? I am Canadian, which makes me a bit half and half. We have a lot of American influences obviously, and I live in a part of Canada that is frequently described (cringingly) as a Little Bit of Olde England. I have many British relatives and a smaller subset of Canadian relatives with a strong penchant for all things British. And I grew up reading British boarding school books and still love reading British books. Originally I started writing this book with a British friend, Kate LeVann. She was going to be the British voice and I was going to be the American, but that hit the skids relatively early in the process and I decided to just run with it, knowing that clever editors would pick up all my glaringly non-British mistakes. I think both characters are suitably over the top with their nationalities such that they come off as being so incredibly different, it's part of what makes the book fun. I have never had so much fun writing two characters, that's for sure. You write adult fiction, YA, and MG! Any more MG projects in the works right now? I am writing Freddie Blue Anderson's story, which will be middle grade and will (hopefully) delve into the subject of mental illness in children, as well as touch on things like how society instills a terrible vanity into pre-teens and how sometimes that can be very difficult for them to manage. And bullying. And toxic friendships that can sometimes be very difficult to dodge. Also, there are auditions and acting; friendship and loss. It doesn't sound that cheery when I describe it like that, but much like ENCYCLOPEDIA OF ME and FINDING RUBY STARLING, I think it has a lot of moments of humour all huddled around a much bigger, more serious issue. I also just sold two YA novels to Farrar Strauss Giroux and I'm really excited to see what happens with them. One is called GREAT WHITE ME, and the other is titled HOW TO SAY YOU'RE SORRY TO THE DEAD. My pet project right now is an adult literary mystery, although that is not really the right descriptor either as it's not so much a mystery as it is an examination of life in the 21st century, wherein it's not as uncommon as it certainly should be for someone to, say, shoot up a school full of children. It's a look at tragedy in the Pinterest world, let's say. I don't really know for certain where it's going, but there are beaches and long grasses and fireflies (or the search for them). I feel like when I'm asked to describe it, all I see are the sand dunes and crashing waves, so there you have it. I'm loving the experience of writing it, so far. Fundamentally, I don't find there is much difference in writing for teens or tweens or adults, it comes down to the age of the protagonist and then, obviously, the way they see the world through their experience. I feel very lucky to be doing any of it, I couldn't have made up a better job for myself. Thank you so much, Karen! I can’t wait to read THE ENCYLOPEDIA OF ME and am thrilled there is another companion novel coming! Project Mayhem readers, one lovely commenter will be chosen to receive a copy of THE ENCYLOPEDIA OF ME and a signed copy of FINDING RUBY STARLING. (Be sure to give us a way to contact you in your comment.) These are really fantastic gems to add to any MG collection! I hope you love them as much as I did! 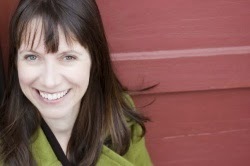 You can find more about Karen at her website, and on Twitter. Did you ever imagine a long-lost twin when you were growing up? Thanks for introducing these lovely sounding books, and this interesting author. As a Brit living in America for 24 years, I'm fascinated to see how the author pulls off this dual narrative but, alas, as a Project Mayhem member, I'm ineligible for the drawing. Will have to snoop out my own copy(ies). Yes, Michael! I think w/your cross-the-pond identity, you'd get extra special enjoyment out of Ruth and Ruby. I hope you do track them down! Wow, Joy--thanks for this great interview! Karen's books sound fantastic! I was a huge fan of WHERE'D YOU GO, BERNADETTE, so I love the idea of reading an MG book written mostly in e-mails. Can't wait to check it out. Oh gosh, BERNADETTE is a fantastic comp for this - except for MG, of course. I bet you'll love it! Yeah, I had a sister, and yet the idea of a long-lost sister who would be everything my real sister wasn't (I guess?) was a total fantasy of mine. Loved The Parent Trap! I know you'll love Karen's books! This book looks like so much fun! Definitely adding it to my to-read pile. Thanks for stopping by, Karen! Both of these books look like a lot of fun. I love the idea of telling a story in emails and scripts as well. I loved The Parent Trap. It's fun to see an updated take on this story. These two novels are right up my alley. Thanks for the great interview. I didn't imagine having a long-list twin when I was growing up.... but my sister and I are SO different that we sometimes wondered if we weren't biologically related. Thanks for this great Q and A! I loved THE ENCYCLOPEDIA OF ME, and I also love novels told through emails and letters AND The Parent Trap. So I am extraordinarily excited for FINDING RUBY STARLING! I'm happy to hear that there will be a Freddie Blue book, too!